WOMEN IN LITERATURE – A QUESTION OF POWER. Even though I am male, I like to think of myself as a feminist. That is not to say that I believe men and women are equal. Everyone is different so the idea of equality cannot be anything but a false premise. But I cannot avoid the fact that, in our world, in general, women are smaller and poorer than men. Nor can I avoid the fact that the rich and the strong have the power to exploit the weak and the poor, and frequently cannot resist the temptation to do so. So women are frequently abused, intimidated and discriminated against. In many societies and situations, this exploitation even has a degree of social acceptance. The feminist movement fight this battle with a two pronged attack. I will call the first problem ‘the exploitative male’ problem. To tackle this feminists campaign to ensure that any unfair treatment of women is seen as immoral and unacceptable, with crusades like ‘MeToo’ and the movement to remove discrimination in the workplace. At the same time, they struggle to redress the balance of power between men and women, through various equal rights initiatives. This I will call the ‘gender power imbalance’ problem. This is not a new battle. It has been going on for centuries. I am going to look at four examples, from the 19th, 20th and 21st centuries, of how novelists have become involved in support for the feminist struggle. Jane Austin is revered as both an author and as an early campaigner for woman’s rights. In Pride and Prejudice she attacks both the exploitative male and the gender power balance. 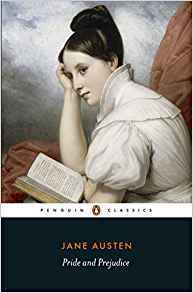 She depicts the Bennet girls, with no prospects for their future because their father’s estate is to pass to the nearest male heir, their cousin, Mr Collins. She portrays him as a despicable and undeserving sycophant and so underlines her protest at this particular gender power imbalance. The power gap in romantic relationships does not escape her attention either. The young women wait and hope for signs of attention, deprived of any opportunity to take the initiative themselves. Of course, they always have the opportunity to say no, but only Austin’s rebellious feminist champion Elizabeth ever has the courage to take this step. Austin also tackles the exploitative male problem, as she depicts the developing relationship between the haughty, imperious Mr Darcy and Elizabeth. She refuses to be dominated by his attitude and behaviour and eventually he sees the error of his ways and accepts her as his soulmate if not completely his equal. Modern feminists may criticise Elizabeth for finally succumbing to social convention and accepting her role as a respectful wife, but for her time Jane Austin was a radical voice in support of women’s rights. I suppose everyone has read the book or seen the many film versions of this story, but if by chance you haven’t, don’t miss this early feminist voice. In the first book in his Palliser Novels series, Trollope reveals himself as an unlikely supporter of the feminist movement. In an amusing sub-plot of this novel, we find a recently widowed, youngish lady, Mrs Greenow, who has found (or arranged for) herself to be the only heir to her much older deceased husband’s fortune. By her own efforts, and the inevitable death of her older husband, she has solved the gender power imbalance problem by becoming wealthy in her own right. So she finds herself with plenty of money, but short of a man. As you might expect of such a determined and resourceful woman, she has no intention of being ensnared by any kind of exploitative male. She is being pursued relentlessly by two suitors. One of these is a wealthy farmer, while the other is a penniless ex-soldier and adventurer. This is the most explicitly feminist book I have chosen to talk about, dealing as it does with the physical and mental abuse of women within marriage. Doyle depicts the tragic life of a young woman who is married to a monster, and endures the horrific effects of both an exploitative male and the gender power imbalance. Its great strength is the insight into the mental state of the victim. She is trapped not just by her physical inferiority and her economic dependence on her husband, but by her own feelings and beliefs that constrain her from escaping from her nightmarish life. She is convinced of the inevitability of her subservient role, the need to cook, clean, look after the children and to respond to the outrageous demands of her drunken spouse. Her upbringing in working class Ireland has conditioned her to this fate, just as the same social circumstances have produced the macho mind-set in which her tormentor believes that he is genuinely entitled to abuse and her and treat her as a slave. In my own novel, Ogg, I address the problems of gender power imbalance and the exploitative male in a more subtle way. In this novel, the young heroine Antonia is recruited by a mythical (male) supernatural being called Ogg ostensibly to solve the imminent end of the world. In fact, Ogg is a Svengali –like character who spends his time, in a rather patronising manner, developing and encouraging Antonia’s powers of logical thinking and deduction: an example of the more powerful male controlling the mind of the weaker female, even though it is for her own good. But the twist is in the ending. Abandoned by her supernatural mentor, Antonia falls back on her own resources and comes to realise that Ogg was probably not an external source of knowledge, but rather the workings of her own mind. So the intellectual inferiority and perceived male exploitation was an illusion. All the time, she had the power and capability within herself. She was a true independent and capable woman.